How do i improve ankle movement? Do we do lateral or medial glides at sub-talar joint? Or mobilise anterior joint medially, while mobilizing posterior joint laterally? 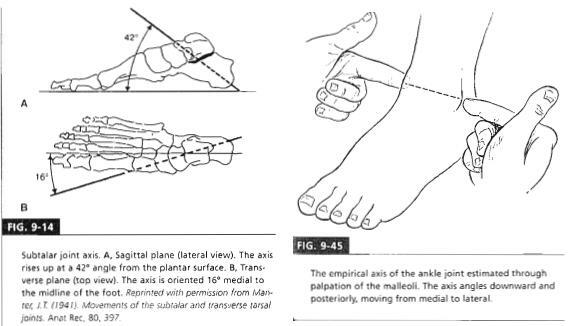 Joint plane at 30 degrees plantarflexion? Re: How do i improve ankle movement? I would think lateral glide at subtalar joint. mulligan wrote: I would think lateral glide at subtalar joint. Supination and pronation occur primarily at the subtalar (talocalcaneal) joint. During supination, the sole faces medially, and during pronation of the sole faces laterally. Subtalar motion is evaluated by grasping the tibia with one hand and inverting and everting the heel with the other hand. The subtalar joint everts in part because the point of contact of the heel is lateral to the center of the ankle joint, thus, producing a valgus thrust on the subtalar joint.